Preheat oven to 200°C (180°C for fan forced oven). Lightly score the fish skin, on both sides, not cutting in too deeply. Place fish on a baking tray lined with baking paper. Rub salt, pepper and 1 tablespoon of olive oil over both sides of fish. Then rub half a garlic clove over both sides of fish. Place lemon slices in the fish cavity and sprinkle with some chopped thyme. Finely chop the garlic and place on top of lemon slices. Melt butter and mix with breadcrumbs, lemon juice, salt, pepper and thyme leaves. Mix together and scatter over fish and drizzle with olive oil. Place in oven and bake for 20 minutes or until fish is just cooked through. Let rest for 3-5 minutes before serving. 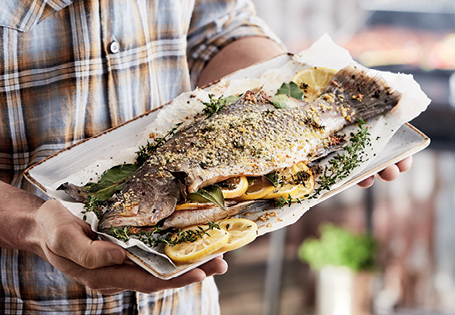 *Before cooking, defrost the frozen whole barramundi in your fridge overnight.